Serena Donovan left London six years ago, her heart broken and her reputation ruined by devilishly handsome Jonathan Dane. Now, with her family's future in peril, she reluctantly agrees to return to England and assume her late twin's identity. The price? 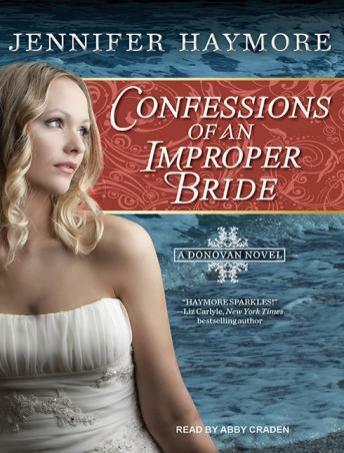 Marry a man she doesn't love and spend the rest of her days living a lie.Jonathan Dane, Earl of Stratford, has become an incorrigible rake, drinking, gambling-and trying to forget Serena Donovan. Yet the moment he is introduced to the prim and proper 'Meg,' he recognizes the sensual young woman who captured his heart. Haunted by his past mistakes, he refuses to lose Serena again. But convincing her to trust him is no easy task. Claiming his lost love means exposing the truth and destroying the life Serena has sacrificed everything to rebuild. With the future of all the Donovans at stake, and their undying passion capable of triggering yet another scandal, how much will Jonathan and Serena risk for a chance at true love?